When we are travelling, most of our exercise must come just from walking about. But in second place, maybe a close second, or even first place at times is swimming. 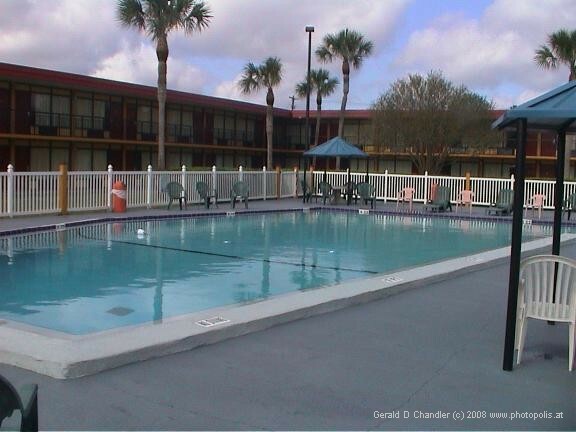 We are always happy when our hotel has a swimming pool. When a friend or relative (we don't choose them for that) has a pool that's great too. For the first few months of 2003 we didn't swim. It was too cold outside in the D.C. area and too expensive inside. But in mid-March we headed south and found warmth and water. 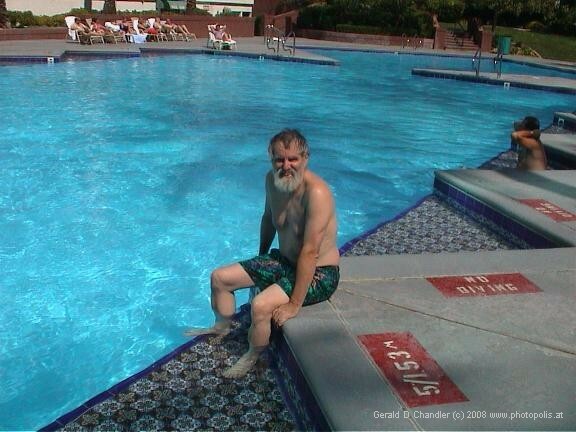 In the ten months since then we have probably spent nine or ten weeks at someplace with a pool. That approaches 20%, not too bad. This little photo essay only includes US pools, but we also swam in Mexican pools. Our first pool of the year. We crossed the border from Georgia into Florida and suddenly the temperature went from 35F to 85F. Well, that is an exaggeration, but it felt like that. A few hours into the Sunshine State and we had found a motel. After an afternoon of sightseeing we were into the pool. Next day we were a few hundred miles farther south, a few degrees hotter, and next to a pool that made us jealous. 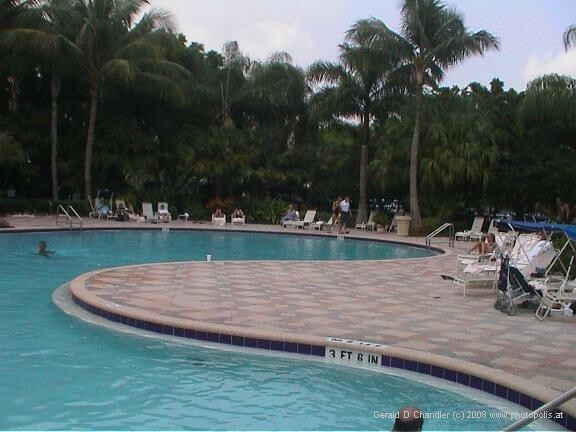 Our friends from Middletown retired to South Florida and live in a gated community with a terrific pool. As usual, there were far more people around it than in it. That didn't displease us a bit as it meant there was plenty of room for us. We spent a few minutes outside the pool too. Too bad we couldn't come back the next day. It was two months later, in May, before we and a swimming pool had a significant encounter. 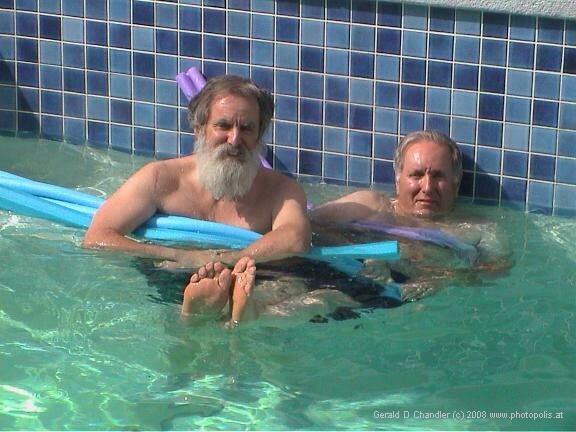 Gerry's brother had a small pool in the back of his home in Phoenix. We visited three times in May, June, and July. In July heat records were broken — one night the overnight low was about 96F. 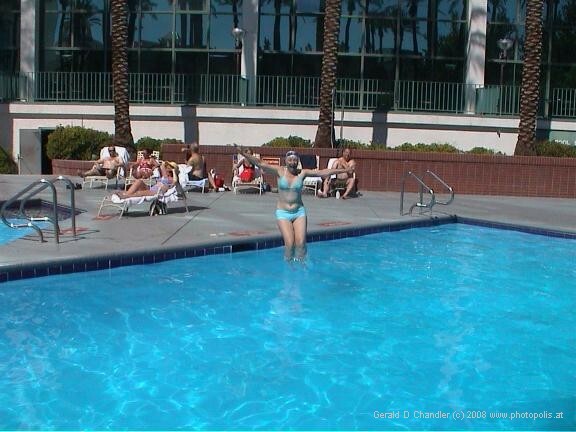 So our excursions outdoors were often to the pool to soak. 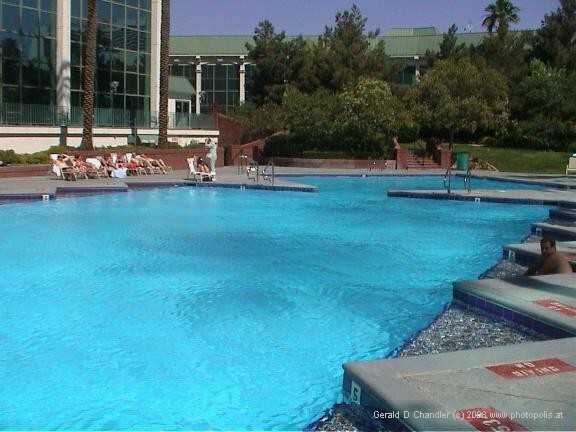 Our all-time favorite pool is the one at the Frontier Hotel in Las Vegas. We discovered it in 1993. This time when we came back to Las Vegas we stopped for a few days and stayed two weeks. There are a few pools that come close to matching it in our memories: the outdoor pool in Nancy, France where Gerry often swam and had lunch before going back to his teaching duties; the fine pool in Nha Trahn, Vietnam that had so much sun and relaxation qualities; and the pool in Phimai, Thailand which is really a simple square with no frills like palm trees, but was such a pleasant place to be. 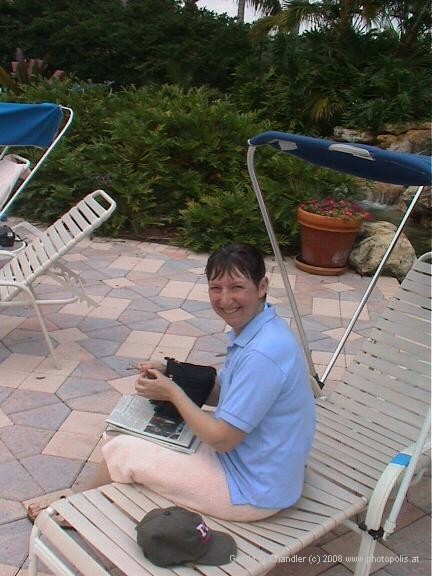 We spent half an hour at a time in the Frontier pool, and another hour reading poolside. Once in a while we got a little excited. And then we just sat around too.